The Venue advertised it as “Midge Ure: the voice of Ultravox”. While technically true, the set was a fairly representative slice of a 30 plus year career. One of my musical regrets was never having had the opportunity to see Ultravox perform live. Coincidentally, I picked up a copy of Ure’s biography a few months ago but had not begun to read it until the show was announced a few weeks back. It was interesting to read the behind the scenes information on all those releases that I had just dutifully purchased. It is rather astonishing just how much both artist and fan were at the mercy of the labels back then. The occasional unarticulated misgivings that I remember having at the time with a few of the releases make a good deal more sense after the curtain was opened a little and some of the inner workings were revealed. Midge was quite chatty in between songs, providing snippets of history spanning his entire career. While tuning, in between songs, he joked about the indignity of having to drive up in a van from Los Angeles. “I am a Rock star! I was in LIVEAID.” Apparently the tour seems to have been a trial run, of sorts, for a potential full Ultravox tour. As Ure noted the band should be the recipient of an award for having unsuccessfully attempted to crack the North American market for the longest period of time. In a way, the fact that the backing band wasn’t Ultravox and Ure used his guitar for every song turned what might have been an exercise in nostalgia into something unique and powerful. The guitar driven version of ‘Fade to Grey’ was a pleasant surprise. The rousing rendition of ‘The Voice’ toward the end followed by the single song encore of ‘Dancing with Tears in my Eyes’ was far more satisfying than I could have expected. I hadn’t finished the book’s last few chapters until this evening. The positive, energetic experience that I had squares well with Ure’s expressed realization of the power of a more intimate connection with his fans. The reaction I witnessed to ‘Vienna’ was no different than the reaction to Frightened Rabbit’s ‘Keep Yourself Warm’. Personally, I don’t understand how either one makes for a very good sing along but the point is the deep emotional connection of the fans, for all intents and purposes, was the same. Walking into the venue I was greeted with the Thompson Twin’s ‘Hold Me Now’. I have this love– hate relationship with most of the decade. While waiting for the show, people around me are reminiscing about having recently seen the Human League and New Order and I’m thinking about how much I’m looking forward to seeing Chvrches in a few weeks time. Don’t get me wrong – my first CD was ‘Crash’ and I have a very vivid memory of listening and waiting for an American college radio station to play something from ‘Power Corruption and Lies’ in the summer of 1983. I just don’t understand how those of my generation stopped looking for new bands in 1989. None of that has anything to do with my appreciation of the show. It’s my blog and that means I can vent whenever I want. I’ve never stopped being a fan of Midge Ure. Watching a few Slik videos for the first time before the show, I was struck with how powerful the voice was even then. Finally hearing an artist whose songs have been inside my head most of my life was a moving experience. It was long overdue. Even better– I’ve now got a fair bit of his soaring guitar to accompany it. And, one day, I might just get to see Ultravox afterall. 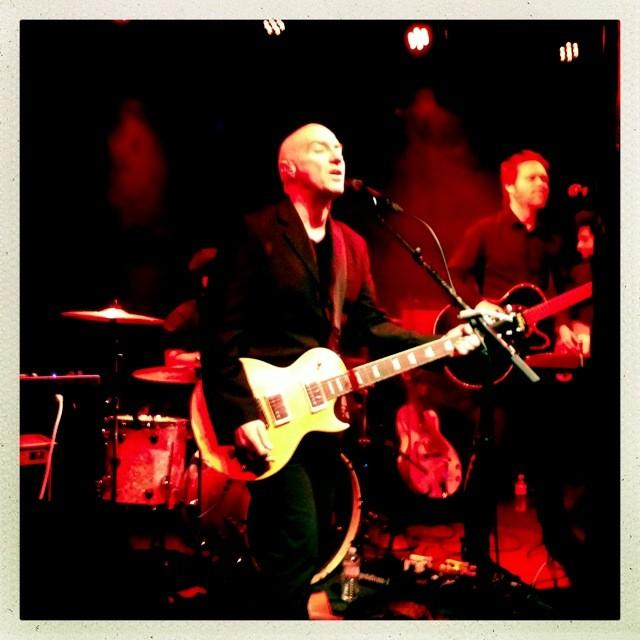 This entry was posted in Behind the Scenes, glasGOwest and tagged Midge Ure. The show was fantastic. Of all the concerts I have seen in my life, nobody has the passion and sincerity for the love of music more that Midge Ure. What an absolute blast to see him perform in person. Just saw that the show was sold out. Hopefully he will be back, either again solo or with Ultravox. I will definitely be there.